The perfect solution for the Christmas tree watering blues.This totally new concept and design solves the problems of trees getting too dry and reservoir overflow. No more need to crawl under the tree...Tree Green monitors and displays four water levels so you know when to water and how much to add. Just place the depth sensor (which is connected to the ornament by a thin cable) in the reservoir and secure it to the tree with the pushpin that is included. Then hang the ornament on the tree. Its that easy! Using colored lights and music, Tree Green continuously indicates the trees water level. 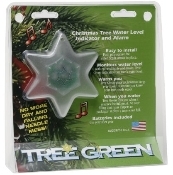 Tree Green plays a Christmas song when the water is low, ensuring that you know when your tree needs water. When filling, youll know when the reservoir is full by the tune Tree Green plays. The water depth is measured by the sensor. Corresponding lights on the ornament indicate one of four reservoir levels. In addition, an audible alarm plays a Christmas tune once per hour when the water is almost empty and every half hour when empty. With this device, your tree need never be dry, and carpet damaging overfills will be a thing of the past. Includes two common CR2032 camera batteries, enough to power TreeGreen for a full season. And Tree Green is built to perform year after year.